Our 14′ Tropical Xtreme Ball Pit Slides are a BLAST! There are over 4,000 plastic balls in this ball pit. Awesome for kids ages 3 and up. Older "kids at heart" are welcome too - parents! Great fun for the whole family. 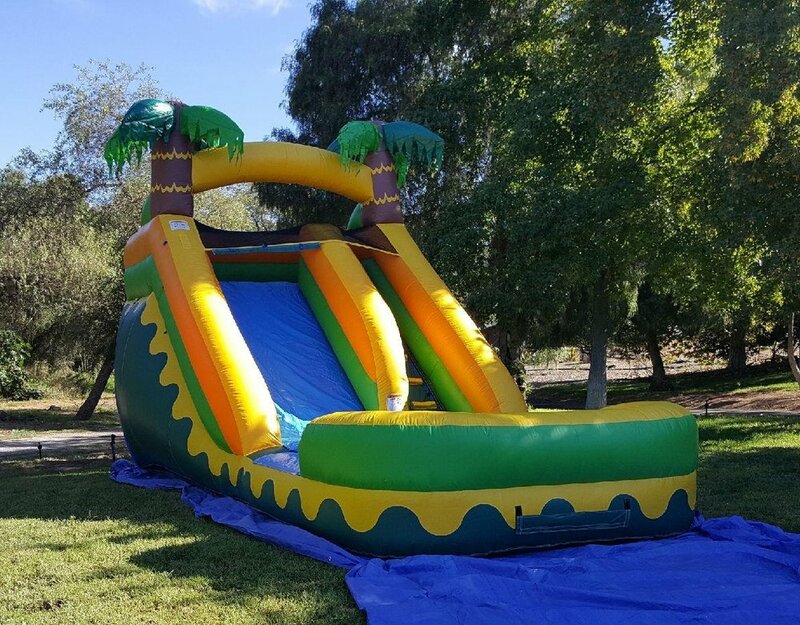 Climb up 14 feet to a No-Jump Top with overhead netting, that forces players to slide down correctly, (keeping them secure), as well as a safety bumper wall at the end of the slide. Riders climb up the right side and slide down the left side. The slide pool pits are padded underneath, so there is no pain sliding down. Our ball pit slides are a great alternative to water slides and are safer for younger kiddos to enjoy too. With a brightly-colored tropical theme and 3,000 vibrant colored plastic balls, this slide is sure to be a hit! PLEASE NOTE: Slides can only be set up on grass, artificial turf, cement or bricks/pavers. We do not set up on dirt, weeds or dead grass. SORRY, NO EXCEPTIONS! Why rent a Ball Pit Slide from Bouncin' Kids? -It's a safer alternative for the younger ones at your party - no water. -When your party is over, the balls are sanitized in a non toxic, biodegradable, sanitizing solution so each ball gets disinfected properly and safely prior to the next rental. (The owner of Bouncin' Kids takes care of the sanitizing personally to ensure proper cleanliness). -The plastic balls are a no fuss, no mess rental. Just pure nostalgic fun to share with your kids! *Prices shown are for cash payment. (Regular price via credit or debit card is approx. 5% more.) A delivery fee may apply.